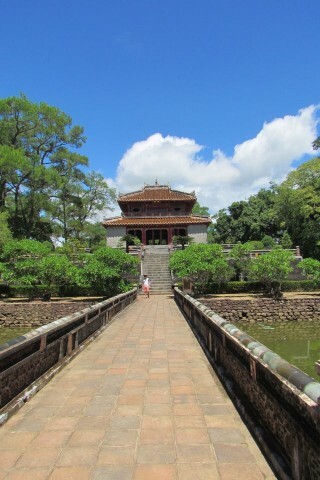 Tombs and pagodas lie everywhere in and around Hue. Those with an endless appetite for culture could sate themselves every day for a solid week, with still more left on the table, but the majority of travellers are satisfied with just a taste. The tombs were built within the past 200 years, which makes it somewhat surprising that most of them are already falling to pieces. This is partly due to poor upkeep over the years, and partly due the original construction techniques, which weren’t all that exceptional. They were built by puppet emperors who had little real power, other than to sit around contemplating their own deaths and building monuments in anticipation of the occasion. Like Graceland and Never Land, they are monuments to ego, but in this case, the egos involved are much more obscure and probably less interesting to contemporary visitors. That said, some of the tombs are located on large, beautiful grounds, and the crumbling edifices exude a certain air of aesthetically-pleasing decrepitude. Tu Duc is on the most expansive grounds and takes the most time to see. It’s rivalled by Minh Mang, which is also on a large plot, but we thought Tu Duc was a little better. Choose between the two so you don’t suffer from tomb burnout, but then definitely see Khai Dinh—it’s in a different style from the others, is smaller, easier to visit, and in better shape. Gia Long is, by far, the best adventure in terms of a visit; it’s usually deserted and the ethereal natural beauty of the spot is hard to beat. Each tomb has a 100,000 VND admission fee and are open 07:00-18:00. From Le Loi, head south on Dien Bien Phu (across from La Residence) for two kilometres until it ends at Dan Nam Giao. Take a right on Le Ngu Cat, go 2.2 kilometres to where it tees with Nguyen Tran Cong Chua. Take a left and the tomb is 700 metres down, on the left. From Le Loi, head south on Dien Bien Phu (across from La Residence), for two kilometres until it ends at Dan Nam Giao. Jog right then immediately left, heading south on Minh Mang. The tomb is five kilometres down on the right. From Le Loi, head south on Dien Bien Phu (across from La Residence), for two kilometres until it ends at Dan Nam Giao. Jog right then immediately left, heading south on Minh Mang. Five kilometres down you’ll pass Khai Dinh Tomb on the right. Continue 1.3 kilometres to where a short right turn leads on to the main highway. Take a left on the highway (northbound) a kilometre to the turn for Minh Mang on the left—look for the roadside cafes and a blue sign. After turning left go straight for two kilometres to where there’s a left turn at the base of a hill—more cafes mark the spot and a sign. Take that left and the tomb is 800 metres down. From Le Loi, head south on Dien Bien Phu (across from La Residence) for two kilometres until it ends at Dan Nam Giao. Jog right then immediately left, heading south on Minh Mang. Five kilometres down you’ll pass Khai Dinh tomb on the right. Continue 1.6 kilometres to where the road ends at the river. Take a left, and you’ll come to a tollbridge to get over the river – prices vary, but it should be 10,000 VND – have the right money ready to save yourself a 10-minute haggle. Once you get to the other side, head away from the water to the ’main road’ and turn left. The turn for the tomb is about three kilometres from the toll-bridge. You’ll find a very obvious intersection (not that there’s any traffic out here) and you’ll see a large village gate on your right. Go through the gate, and the tomb complex is a kilometre further on. If you get lost, ask for laang ya lawm, (Gia Long tomb). Everyone knows where the tombs are, but if you let someone lead you there, they will probably ask you to pay them. Anyway, it’s worth it—it’s a really gorgeous and remote spot. This tomb can also be visited via a longboat trip from one of the organised boat tours that leave from the jetty where Nguyen Cong Tru meets Le Loi; we went by motorbike, but in the heat of the summer the boat would be a far better way to travel.